One of my favorite things to do is pack for upcoming trips. I know most people hate packing, but i am not like most people! Something about it just gives me such a since of satisfaction. Maybe because I LOVE planning for things, I really don’t know lol. Last night I took some time away from the final details of wedding planning to back for the honeymoon. Get this- I fit a weeks worth of clothes, underwear, and shoes into one carryon. Wanna know my secret? 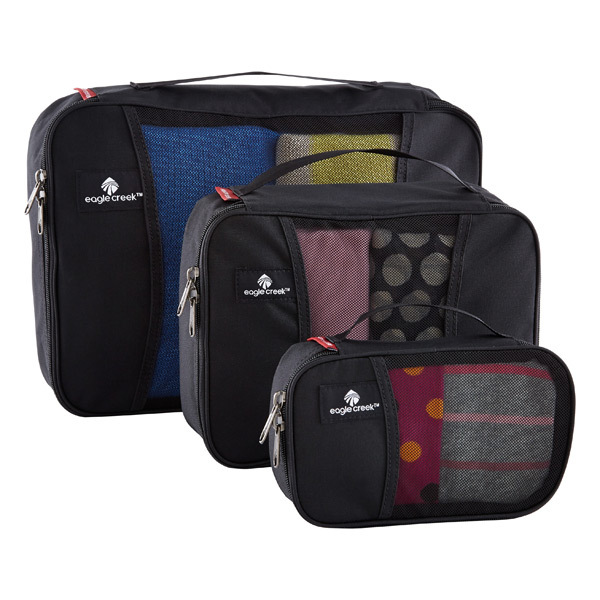 Well here it is, PACKING CUBES! Packing cubes have changed the packing game! I like to pack all my clothes into one large packing cube and my underwear into the medium cube and any miscellaneous items into the small cube. On this trip the miscellaneous items will be my bikini and beach over up. The only thing what will not fit into my carry on is toiletries and makeup. If you are looking to purchase any items for upcoming travel you may be doing this summer. The container store is having a travel sale.